United Continental stock is flying higher following another solid earnings report and guidance increase. But the company's profitability still pales in comparison to that of Delta Air Lines. Over the past year or so, I've been rather skeptical about United Continental's (NASDAQ:UAL) plan to boost its earnings by accelerating its growth rate, particularly in smaller cities. Yet the company's year-to-date results show that its strategy is working. Indeed, United Airlines released another strong earnings report on Tuesday afternoon and raised its full-year guidance for the third consecutive quarter. It now expects to post full-year adjusted earnings per share of $8.00 to $8.75 -- up from an initial guidance range of $6.50 to $8.50 -- even though it is on track to spend an extra $700 million on fuel compared to its original forecast. United Continental's EPS soared last quarter. Image source: United Airlines. This strong 2018 performance has helped United surpass American Airlines in terms of profitability. Catching up to Delta Air Lines (NYSE:DAL) could be a trickier task to pull off, though. Back in July, United Airlines projected that it would achieve a pretax margin between 8% and 10% for the third quarter on a 4% to 6% increase in passenger revenue per available seat mile (PRASM). However, United updated its forecast last month, stating that unit revenue would come in near the high end of its forecast range. Sure enough, PRASM rose 6.1% last quarter. As a result, adjusted pretax margin reached 9.7%, even though fuel costs came in at the upper end of United's guidance range. Adjusted earnings per share surged 36% to $3.06, helped by the combination of an easy year-over-year comparison and tax reform benefits. The fourth quarter outlook is strong, too. United Airlines expects PRASM to rise 3% to 5%, while adjusted nonfuel unit costs should be flat to down 1%. Adjusted pretax margin is set to come in between 5% and 7%, compared to 6.7% in the year-ago period. United Airlines has certainly made substantial progress toward becoming more competitive this year. It is also recapturing virtually the entire year-over-year increase in its fuel costs. That said, its financial performance still doesn't compare to that of Delta Air Lines. Last quarter, Delta's adjusted pretax margin was 13.5%: nearly 4 percentage points ahead of what United achieved. Year to date, United Airlines has earned an adjusted pretax profit of $2.4 billion, compared to $3.9 billion for Delta. (The two companies are similar in size; United is slightly larger in terms of capacity, but Delta generates more revenue.) This also equates to a pretax margin gap of around 4 percentage points. This roughly 4-percentage-point margin gap also extends to the two companies' fourth-quarter forecasts. Whereas United expects to report an adjusted pretax margin between 5% and 7%, Delta's pretax margin guidance range is 9% to 11%. The gap would be closer to 5 percentage points but for some periodic refinery maintenance that Delta is undertaking this quarter. Over the past year, one of United Continental's main selling points to investors has been that the company's valuation is lower than that of Delta Air Lines. However, as United has steadily raised its guidance this year, its stock has flown higher. Meanwhile, Delta Air Lines stock has been stuck in neutral for most of 2018. Delta Air Lines vs. United Continental Market Cap, data by YCharts. 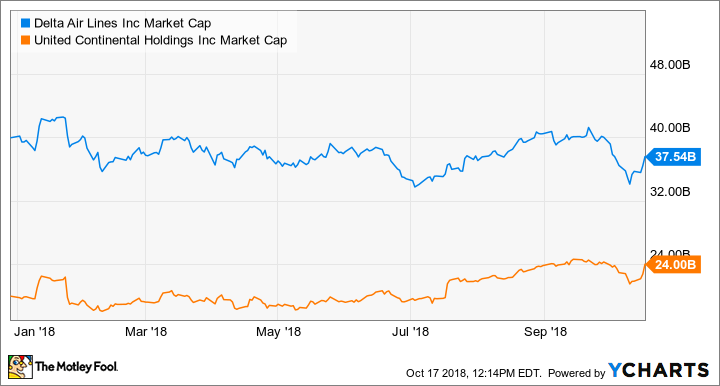 As United moves closer to Delta in terms of market cap, investors will expect it to make significant progress toward reducing the margin gap. United Continental does expect to return to margin expansion next year. But so does Delta Air Lines. Given the latter's slightly lower earnings multiple and much longer track record of success, Delta Air Lines stock still looks like a better long-term investment option than United Continental shares.